Luis' tropical Manchester tart recipe appears in the Pies and Tarts challenge of The Great British Baking Show. Preheat the oven to 220C/425F/Gas 7. Grease and line a 23cm (9 in) tart tin. For the pastry, put the flour and icing sugar in the bowl of a food processor and pulse briefly to mix. Add the butter and pulse until the mixture resembles fine breadcrumbs. Tip the mixture out into a large mixing bowl and add the egg yolks and two tablespoons of cold water. Mix with your hands until the mixture comes together. On a lightly floured work surface, briefly knead the dough to bring the pastry together. Flatten to a thick circle, wrap in cling film and chill in the fridge for 20 minutes. On a generously floured work surface roll out the pastry to a circle about 3mm thick and big enough to line the tart tin with some excess. Line the tart tin with the pastry, using a rolling pin to help you lift the pastry. Gently push the pastry into the edges and leave any excess overhanging the tin. Place the tart tin on a baking tray. Prick the base of the pastry all over with a fork. Rest the pastry case in the fridge for 10 minutes. When the pastry is chilled, line it with four sheets of cling film or a scrunched up piece of baking parchment. Completely fill with baking beans (or dry pulses) and blind bake for 20 minutes on the middle shelf of the oven. Remove from oven and lift out the baking beans using the cling film or baking parchment. Brush the pastry case with egg wash.
Return to the oven for eight minutes, or until the pastry looks dry and golden-brown. Lower the oven temperature to 140C/275F/Gas 1. For the filling, in a large heatproof bowl add the eggs, orange zest, lime zest and 150g (5½ oz) of the caster sugar. Stir gently until the sugar is dissolved - try to avoid getting too much air into the mixture. In a food processor, blend half of the mango to a purée. Pass through a sieve to remove any fibers and measure out 50g (1¾ oz) of purée (any leftover purée can be stored in the fridge for 2-3 days and used in smoothies, sorbets or as a sauce for desserts). Cut the passionfruits in half and pass the pulp through a sieve into a measuring jug. Add orange juice to make 100ml (3½ fl oz) of passionfruit and juice combined. Pour into the egg mixture along with the rum, mango purée and double cream. Stir gently until well mixed. Set aside. For the pastry, trim the excess pastry from the sides using a sharp knife. Meanwhile, place the bowl of filling over a pan of gently simmering water (do not let the water touch the bowl). Stir continuously until the mixture reaches 55C/130F on a cook’s thermometer. Remove from the oven and set aside to cool for 10 minutes. Remove the tin and place the tart on a cooling rack. When it is completely cool, put the tart on a serving plate. For the decoration, scatter the desiccated coconut in a pattern in the middle of the tart. 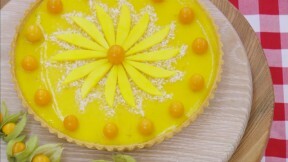 Neatly slice the remaining mango and arrange the slices around the edge of the tart. Finish with the physalis placed evenly around the tart.